Like the Mona Lisa or Michelangelo's David, the portrait of Stephen Colbert is a lasting testimony to the power of human spirit and beauty. Today is the last day to take a gander at Stephen Colbert's very serious and important portrait, which is currently on view at the National Museum of American History in D.C. -- and, as a museum staffer likes to point out, it's hanging next to Dumbo the Flying Elephant. 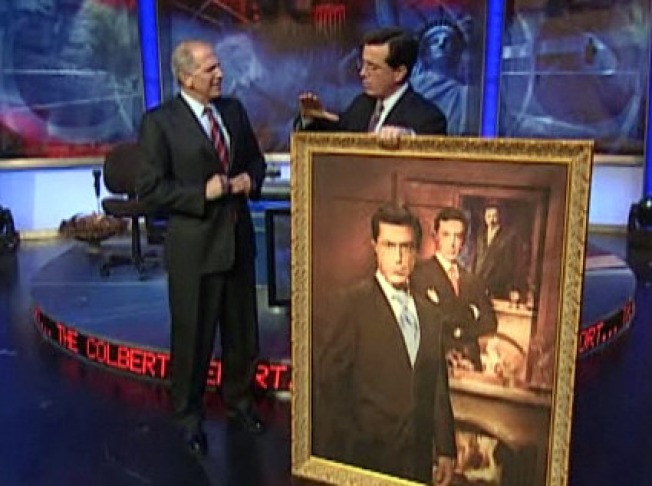 The star of the hard-hitting Comedy Central "Colbert Report" spent time during the 2007-2008 writers' strike traipsing around D.C. with the portrait strapped to his back. He was finally rewarded for his gargantuan efforts. The portrait received a six-week stint on display -- right near the bathrooms at the National Portrait Gallery. That is because Stephen Colbert is a man who knows how to bring the class. The portrait has been hanging in the American History museum since its reopening last November. After tomorrow, the painting is going back into the Smithsonian's "collection" -- we think that actually means "storage" -- but we're hoping it'll make it to the Louvre soon. Anything less would be a national tragedy. The museum is open until 5:30 p.m. today.